Make use of your bus ticket in the morning. There's less people around and boarding is quick and easy. Not to mention you get first pick of the good seats! We are comparing Vienna Hop on Hop off Bus Prices from leading ticket suppliers and Try to find you Cheap tickets prices on the market. Buses run every 15 minutes and there are staff at some stops to help you find your way around the city. The bus routes provide an easy and speedy way to explore Austria's sprawling capital and hop from attraction to theatre to cafe as you go! Upgrade your 24 hour ticket to 48 or 72 hours depending on how much you want to see. Why not use your bus ticket to visit the beautiful St.Stephens Cathedral, built in the 14th century and boasting both Romansque and Gothic architecture. The Red Line takes you along the cities "ring road" where you'll see the grandest buildings including the Imperial Palace, Parliament Houses and the National Theatre. The Yellow Line allows you to visit teh Museum of Military History, Belvedere Palace and the famous Schönbrunn Palace. The Blue Line takes you down the "Danube Route" where you'll pass VIenna's Giant Ferris Wheel and the Danube Tower. To explore the surrounding countryside take the Green Line out to the wine growing village of Grinzing and visit Klosterneubrug Abbey. The Grey Line explores the Roman City Quarter where you can explore Austria's largest palace complex. Great for families (there's an audio channel for kids on the bus). Perfect way to get your bearings in the city. Ideal for those looking to explore further afield. Your Experience With Vienna Hop on Hop off Bus? Make use of your 24 hour bus ticket to visit some of Vienna's biggest and best attractions including Hofburg Palace and St.Stephen's Cathedral. 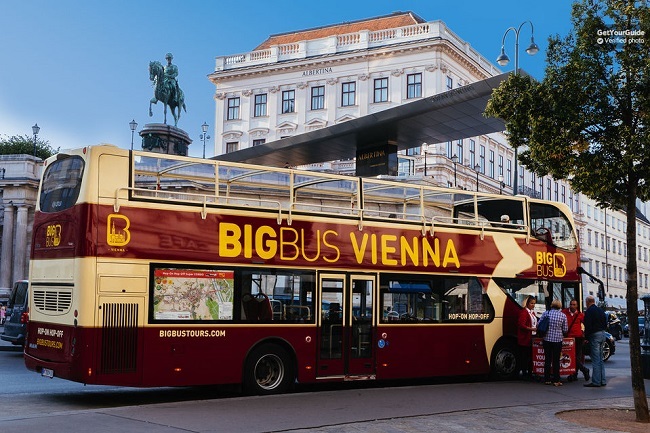 Ride all six bus lines around Vienna's historic centre. Enjoy travelling on a comfortable state of the art tour bus. Venture further afield with your ticket and visit Vienna's surrounding countryside with a trip to Carnuntum's Roman ruins or the Klosterneuburg Abbey. Enjoy a complimentary walking tour around Vienna's city centre, departing from the State Opera. What Vienna Hop on Hop off Bus Includes? 24 hour access to six lines of hop-on-hop-off bus routes (red, blue, green, orange, yellow and grey lines). Optional guided walking tour through the city centre. Buses have WIFI and audio guides in 16 languages. Unbiased comparison of Vienna's Hop-on Hop-off Bus Bus Tours operators(Vienna Hop on Hop off vs Big Bus Tour Vienna vs Vienna Hop-On Hop-Off Bus + Boat) based extensive research, Tripindicator team came up with comprehensive recommendations about Vienna sightseeing tours which helps you choosing Right Vienna Sightseeing Bus Tour for your travel. Unbiased comparison of Vienna's Tourist Skip-line Passes(Vienna Pass or Vienna City Card Skip-line) based extensive research, Tripindicator team came up with comprehensive recommendations which helps you choosing Right Vienna City Skip-line Pass for your travel. It is worth to check Comparison of Vienna Pass or Vienna City Card is Worth It? Rise early to make the most out of your bus ticket throughout the day. Study the bus map prior to boarding to familarise yourself with the route. This way you'll have more time to travel further afield! Travelers Reviews about Vienna Hop on Hop off Bus? This hop-on-hop-off bus is rated 4 stars on Tripadvisor with many customers saying it's a great way to get your bearings in the city, the staff at bus stops were friendly and that buses were frequent and reliable. Buses are accessible for wheelchair users. Tickets can be received via email or SMS instantly upon booking. Simply your smartphone to present your ticket on the bus (or print out the email voucher). Make sure you either print your ticket out or have it on your mobile. Have a rough idea of what you want to see in the city and where they are in relation to the bus routes. This way you'll utilise your time better. Hop-on-Hop-Off Vienna State Opera Stop, Karlsplatz Station, 1010, Vienna.